I love bacon and eggs for breakfast, but I get tired of the standard plain sunny side up with two strips on the side. These recipes showcase better ways to combine these two great tastes, and the results are yummy. I sometimes make the bacon and egg skillet for dinner because it’s just so easy, and so good. The addition of onions and carrots is unusual, but wait until you taste it! And best of all, the clean up after cooking is extra easy. Slice the bacon across the grain into small strips. Over medium heat, melt the butter in a large skillet. Add the vegetables and bacon. Stirring often, saute the bacon and vegetables in the butter for about 20 minutes, until the bacon starts to crisp on the edges and the vegetables begin to caramelize. Spread the mixture over the skillet evenly, and then make a well in each quarter section. When the eggs are almost done, sprinkle the cheese over the top and let cook a little more until the cheese melts. Serve hot. Enjoy! Instead of using broccoli, carrots and celery, use 6-8 ounces of turnips cut in a small dice, and make sure to cook the onions and turnips long enough to let them caramelize a little. The result tastes just like hash browns.. Delicious! Preheat the oven to 350 degrees F. Butter 4 small glass or ceramic ramekins (6 oz size). Cover each egg with 1/4 cup of cheese and 1/4 cup of heated cream and season with salt and pepper to taste. Bake for 15 minutes, or until the cheese is melted and the egg whites are mostly done. 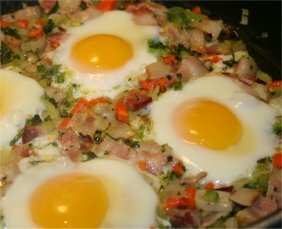 Crumble two slices of cooked bacon over each egg and serve immediately. Butter a glass 9 x 15 baking dish and set aside. Place the cream cheese in a glass bowl and microwave for 30-45 seconds to soften. Whip the cream cheese until it is smooth and lump free. Add the first egg to the cream cheese and whip until smooth. Add bacon crumbles, cheese and spices and mix well. Bake for 35 minutes until golden around the edges and set.